The vast majority of extra virgin olive oil (EVOO) sold and eaten throughout the world is purchased in a supermarket, so independent reviews of the quality of extra virgin olive oils in this market are invaluable. The Australian Consumer Association (ACA) does such a thing. The ACA is a respected not for profit and fiercely independent organisation that Australian consumers ‘go to’ when they want reliable and trustworthy advice on what to buy, and what to look for when buying it. Thankfully for Australian extra virgin olive oil consumers, the importance of this product hasn’t slipped by the ACA as they have reviewed EVOO’s sold in Australian supermarkets every four years or so since 2000. The ACA samples extra virgin olive oils from Australian supermarket shelves and asks a panel of experienced extra virgin olive oil tasters to assess their quality. The selected oils represent most of the major nationally available brands, but also include some that are only available in smaller independent supermarkets. The tastings are conducted totally blind i.e. no information about the oil is revealed to the tasters. The tasters are drawn from a variety of industry sectors (growers, processors, chefs and (mostly) tasters trained using International Olive Council tasting protocols), None of the tasters have any association with the products being evaluated. The results are published in the ACA magazine “Choice”. 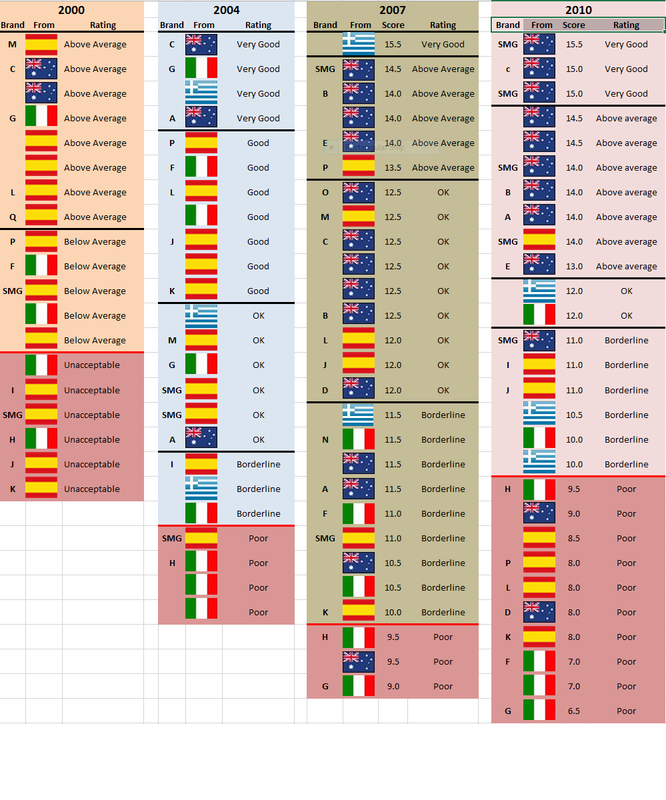 I have taken the liberty of trawling through past issues reporting olive oil reports and have summarised the results in the table below. I have not published the brand names of the oils, as this is the domain of the ACA. Interested readers can go here to find the identity of the 2010 oils, and details as to why they were scored as they were. However, in the table that I have provided which summarises the results of 4 ACA tastings since 2000 (Table 1), I have given each brand a unique letter (if it was available nationally across at least 3 of the 4 tastings conducted) These generally represent the major selling brands in Australia. The consolidated results of the Choice tastings from 2000-2010 are shown at the top of the blog. Notes: SMG = supermarket generic i.e home or white label brand. Olive oils within the same category (2003 and 2007), or allocated the same score (2007 and 2010) are listed in the table in alphabetical order. So What Do the Results of the Tastings Say? 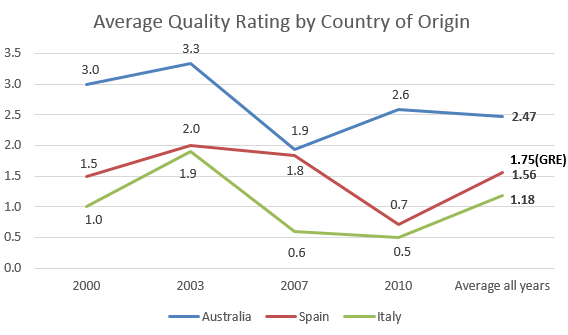 – Extra virgin olive oils made in Australia were rated more highly than those labelled as Spanish and (particularly) those labelled as Italian. This was true of all four tastings spanning over a decade. 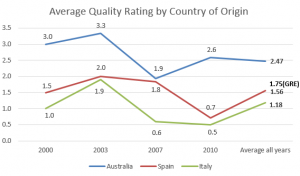 – The average quality of Australian olive oils sampled showed an upward trend. – The average Australian made supermarket EVOO sampled by Choice and sold in 2010 were of a ‘bronze medal’ standard which In lay-mans terms should be interpreted as “a sound defect free olive oil that has distinct olive characters”. – EVOO’s sampled by Choice that were of Spanish origin* were on average ‘marginal’. Scores of around 10 suggest that the oil were marginal when it came to defects but would probably not offend the average supermarket buyer. – EVOO’s sampled by Choice that were of Italian origin* were on average of poor quality and on average fell in the scoring range reserved for oils with clear and distinct defects. In the case where an olive oil was considered to have been of poor/unacceptable quality, a second bottle purchased from another supermarket (sometimes from another State) was re-tasted. The highest of the two ratings were published (and are given here). A small number of Greek oils were sampled – 2 or 3 in each year. Given the small sample size they have not been included in the tables or figures, but I have provided their assessments in footnotes for completeness. I was one of the tasters in 2000, 2003 and 2007. * Extra virgin olive oils imported from the EU into Australia and the US are often labelled as product of the country where they are blended and bottled rather than made. In particular, hundreds of thousands of tonnes of Spanish and North African olive oil is blended and bottled in Italy each year and are sold to the United States and Australia (and probably all other countries outside the EU) as ‘Product of Italy’. Many of the so called Product of Italy oils sold in Australian supermarkets have the distinctive taste and smell of the olive variety Picual…. Picual is not grown in Italy. Transporting olive oil from Spain and Greece and North Africa to Italy and packaging it there allows the ‘Product of Italy’ claim to be made outside the EU. This is a license to print money as on average oils with ‘Product of Italy’ claims attract higher prices than when labelled as product of Spain or Tunisia. So make no mistake. Very few supermarket oils sold outside the EU that are labelled as product of Italy or suggest that they are a product of Italy actually are what they claim. In recent years, some of the brands are more accurately stating on their label that they contain blends of Italian olive oils and those from other countries, blended in Italy. The % breakdown by country is not given, but is very likely that the majority of oils in the blend are not grown in Italy given that Italians consume more olive oil than Italy produces. I recommend that you ring the information line of the producer to find out more about the actual origin of the oils they sell.